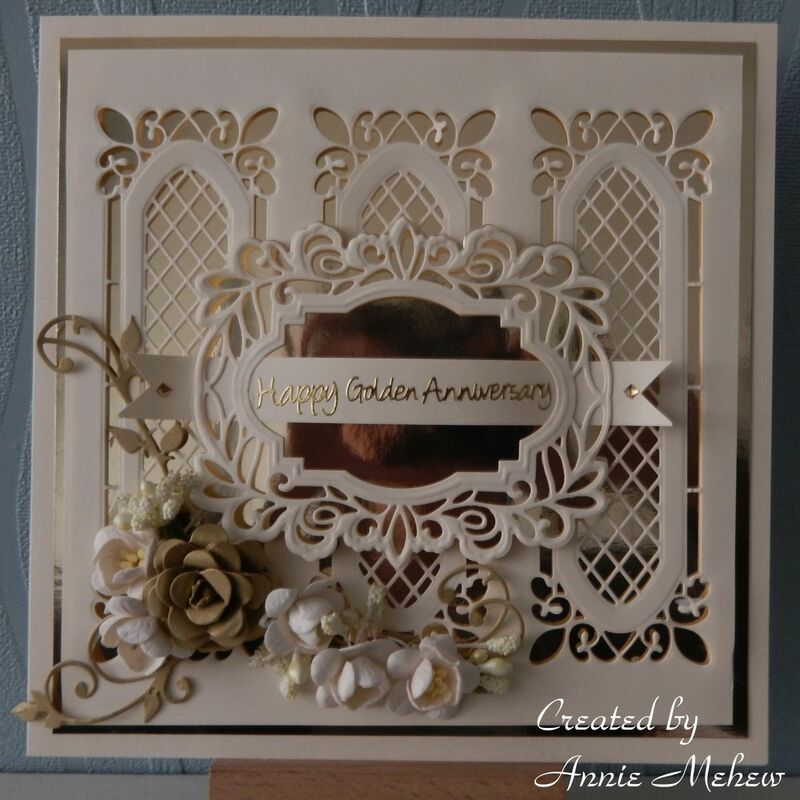 So here we are again it's Friday and time for another Fussy and Fancy Friday Challenge, the lovely talented Tammy is our hostess this week and she has chosen Anniversary and Weddings as her theme. Well it just so happens I had a request to make a Golden Wedding Anniversary , 50 years that is quite an achievement and very special. I used Sue Wilson's dies they do give a guaranteed result and I went for cream and gold and a very simple card really.. The three panels in the background were cut using a striplet die, I am not very good at doing straight!! everything tends to be at a jaunty angle but I tried very hard to get it right. I made the gold rose and used some of my favourite mulberry paper blossoms together with a couple of Marianne flourishes. I diecut a lacey frame and used it to make a buckle effect with the sentiment on a freehand banner. As I am sat here writing this I have suddenly realised that this August my Husband and I will be celebrating our Ruby wedding (40 years) I wonder if he will get me a card like this .... I might have to make it for myself!! We have had a week of lovely weather here in North Wales so my crafting has been put on hold whilst I potter about in the garden, after the soggy Winter we had it is amazing how the garden survived, in fact everything seems bigger and better this year, the apple tree was heavy with blossom so hopefully we will have a great crop fruit. This is such a beautiful card Annie, I just keep looking at it and taking in all the detail. Truly beautiful.